see how long I can go til my eyes need to shut. Anarcha was one of eleven slaves who were purchased by "father" of modern gynecology Dr Marion Sims for his research. Essentially torturing these women, Sims did his research (including surgeries) without offering pain relief or sedation. Our lauded study and history of medicine has for so long been polished of its shameful bits, but in this slender, intense volume of poetry, a name and voice is given to the very real, the very human sacrifice to our knowledge. It's impossible to call this an "enjoyable" read, but it is gutting, gripping, and necessary. Giving voice to the ignored, Christina makes it imperative we know and understand the humans behind any learning we've gained. 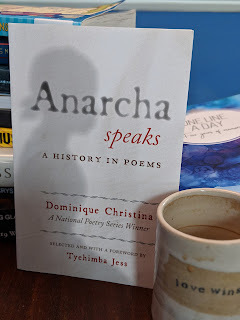 This volume can be read with now knowledge of Anarcha or Dr Sims; Christina's poems make clear what is occurring, and we can't pretend otherwise. We're given the opportunity to bear witness, to hold Anarcha with a tenderness and love she wasn't offered. What makes this volume so important and timely is that horrifically, there is still such intense bias in the medical community toward people of color, especially those who are Black/of African descent. Numerous studies show that even now, black patients are not given the same pain management as white patients and that black pregnant women receive shockingly subpar medical treatment compared to white women. The seeds of these beliefs were planted with the forefathers of medicine and is part of a long history of of unethical treatment (like the Tuskegee syphilis experiment and as documented in The Immortal Life of Henrietta Lacks). I love the cover design, too, with the soft figure and profile and Anarcha's name fuzzy -- but seeming to grow more firm, more clear. History might want to ignore her, but she will have her say.